Achilles tendonitis responds well to rest, ice, massage and correction of faulty foot mechanics with the use of custom orthotic inserts/shoes. How do I know if I have an achilles tendon problem? How do I best treat achilles tendon pain? What are the best achilles tendon stretches or exercsies? 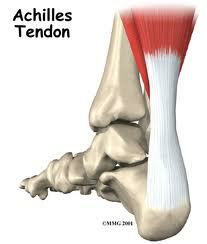 What are the symptoms of an achilles tendon tear? Dr. Michael Horowitz offers a 5-Step process to successfully treating this achilles tendonitis. He can help evaluate & diagnose your condition and recommend the best course of action for you. Call Vancouver Orthotics at 604-737-3668 for more information.